The project reached a interesting level of completion and some aspects need to be addressed. Grass and weeds are almost completed. I also started to heavily weather the concrete pads, particularly in the coal dealer areas. It's quite promising and it blends everything together nicely. I also started to build the concrete ramp out of styrene. It's already in the weathering process and when dry, it will be permanently glued on the layout with epoxy. I'm looking for second hand or unbuilt cars to populate the layout, mainly from North Eastern roads. I'm open to any reasonable offer and cars can be old kits or RTR models, as long as they are suitable for the mid-1950s and fit the theme. I have no preference for manufacturers, as long as they are decent. But remember, no trainset quality stuff (Model Power, old Life-Like, Bachman, Tyco, name it). According to historic pictures of Harlem Station, here is a list of suitable cars to give you an idea of what I'm looking for. Sure, Erie cars should be a priority. 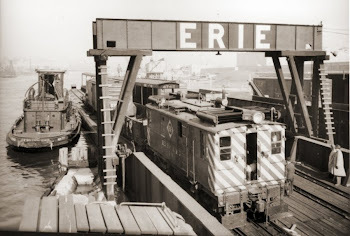 Steel hoppers (varied prototype): Erie, Pennsylvania, Reading, Lehigh Valley. 40ft & 50ft Flat cars: North Eastern Roadnames. 40ft & 50ft Gondolas: North Eastern Roadnames. 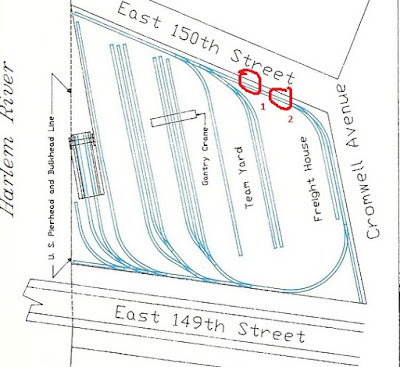 Chris Schmuck kindly remarked another road crossing existed near the freight house. This area was never documented during Harlem Station's existence. First: What's the exact location of the crossing (photographic evidence?). Here are two options. Second: I need information about the freight house. The facade on East 150th Street is never depicted on photos I've seen so far, particularly the 2 storeys part. Any hints or factual information would be appreciated. I have no idea how to contact you, but I do have a photo of #19 at the corner of the freight house showing the wall facing 150th. Another photo of 19 pulling away from the freight house. You can see the crossing planks under the locomotive. You can contact me at matlac@gmail.com. Excellent pictures. Now reasons to postpone the project anymore. Great idea finding the actual numbered cars you see in photos. I've done this with locomotives (mostly thanks to http://www.freightrrofnyc.info/) but only halfheartedly with cars at this point. I'll share anything I find out. Chris- how far did you get with your Harlem Station?